In 1463 Sultan Mehmet II fearing that the Venetians might make an attempt to seize Constantinople built two fortresses on the Dardanelles: Kale Sultanieh on the Asian coast and Kilitbahir on the European one. The Venetians referred to the two fortresses as i Castelli (the castles). Kilitbahir is an extraordinary fortress characterized by a unique design: the image used as a background for this page shows a sketch of its layout. The sultan's architect worked with his compasses to draw elaborate curved lines which perhaps explain the name given to the fortress: Kilitbahir (Key of the Sea). A seven storey tower/castle served both to accommodate the garrison and to have a high observation point to identify enemy ships early. It has a triangular shape, but the sides are the result of two convex lines. The walls were built along the circumferences of three adjoining circles: a simple design which results in very neat lines. The first Ottoman-Venetian war started in 1463 and lasted until 1479. In 1469 the Venetians took the islands of Lemno and Imbro and threatened a major attack on Constantinople, but in the following year an Ottoman fleet managed to seize Negroponte, showing for the first time that the sultan could rely on a strong naval force. 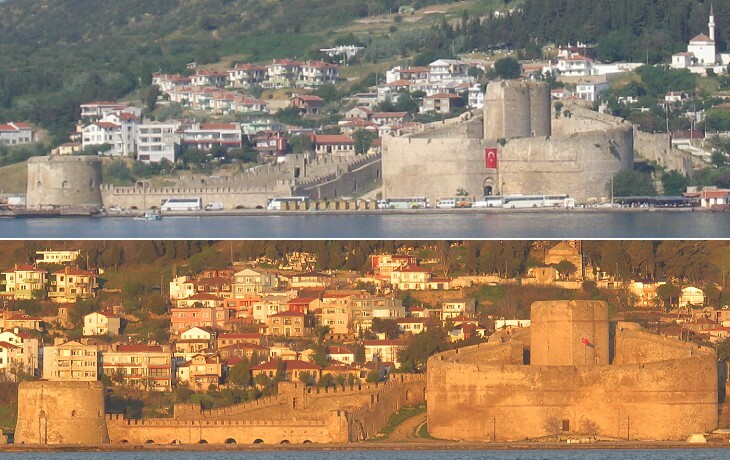 In the following three Ottoman-Venetian wars (1499-1502/1537-41/1570-73), Venice lost most of her possessions in Greece and was unable to threaten yet again the fortresses controlling the Dardanelles. In 1645 the Ottomans declared war on Venice in order to occupy Crete, the last important possession Venice had in the Aegean Sea. Their expedition was very successful and in a matter of months they seized the island, with the exception of its capital Candia and of a few minor fortresses. The Ottoman expedition turned sour when the Venetians reacted by sending their fleet to block the Dardanelles. Their attempt was met with success and year after year they repeated their blockade of the much needed grain supplies Constantinople received from Egypt. The Ottomans realized that their fortresses were able to prevent the Venetians from entering the Dardanelles, but could do little to dislodge the Venetian fleet from anchoring at the mouth of the strait, beyond the reach of the Ottoman cannon, but in a position from which their galeazze (veritable floating fortresses) could control the route to Constantinople.